We don't have any trips to Oman at the moment . Oman is a country of genuine cultural heritage and tradition. Situated on the Arabian Peninsula it is home to mainly low-rise cities and quaint coastal villages and unlike many of its neighboring countries, Oman showcases a more modest side to Arabic culture, away from the flash modernity and more set in traditional values. In some parts of the country, such as the Wahiba Sands, Bedouin communities flourish. The country’s terrain is strikingly varied, with an unbelievably pristine coastline, characterized by countless quiet coves and rocky beaches, windy deserts and lush oases. The capital, Muscat, sits majestically on the Gulf of Oman and is a mix of old and new architecture, although even the most modern high-rises nod to the architectural traditions of the past. Around the coast, fishing communities such as Quiriyat, seemingly untouched by modernity, operate as they have done for centuries, many only accessible by boat. No vaccines obligatory. Consult your GP for additional advice. 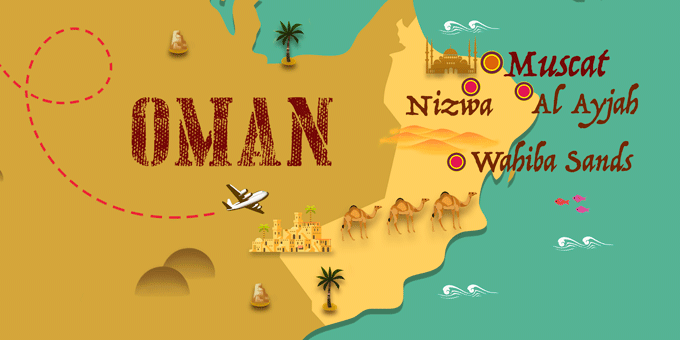 If Oman has caught your attention, leave us your number so we can call you to discuss the voyage that awaits you.